Craig thinks this is funny. Like I can train a husband!! No, this is me trying to help my husband to get up to 5k running. We’re on week three and he’s doing great. Even though we both worked till late tonight I had my trainers on at 9pm ready to go! What choice did he have? We did 28 minutes, including 10 minutes of warm up and cool down. The training consisted of 90 second run/walk and 3 minute run/walk repeated. I was worried for him that the 3 minute run was coming up, so I slowed the pace right down. I didn’t want him gasping for air on the first try; it had to be achievable. When we got back, he checked his emails whilst I did my core exercises. I’ve done these everyday since Saturday and already I feel they are getting easier. My abs scream at me at night when I relax in bed; it’s almost as if they don’t want to be stretched. They want to stay taught and keep me upright. Don’t rest they say! I’m not listening! It’s always nice to do a run that has you still smiling at the end, and not just because you’ve reached the end! Today Jeff (Galloway) told me I had 5 miles to do as part of my half-marathon training. If you’ve been paying attention you might have realised that I was meant to do my 5 miler last night, but, having been out all day wandering the streets of Newcastle Upon Tyne, I was dead-beat. Running in the cool of the morning sounded a better option, especially on rested legs. I decided to run a route I love (because it’s quiet and picturesque) in the opposite direction today. I thought it might be nice to see what the route looked like from the other side! What I forgot about was the amount of hills I had to contend with. Going the other way round, the usual way, the hills are long hauls. This way round they were steep and came one after the other at mile 2. However, hills make us stronger runners and that was my mantra as I clawed at each one. About half way round I encountered a herd of cows being herded onto another field by a quad-biking farmer and his two assistants. One of the hazards of living in the sticks and running on the roads I guess. I had to take to the grass verge as the cows passed me by in case I spooked them or they took a liking to me! It gave me a few moments to get my breath back! I hit 5k at 34 minutes, which was maybe a bit fast considering I had another two miles to do. However I knew that I was approaching a long straight descent and I was looking forward to that. I just had two hills to do first! 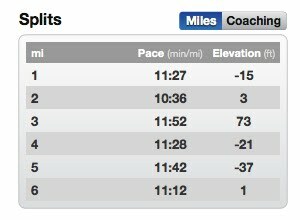 My 5 miles came in at 58 minutes – not a bad run at all. Short entry! Went out in the gorgeous evening sunshine for a training run with my husband. After a 5 minute warm up walk we did three reps of 90 sec running and 2 min walking, with me putting some pressure on in the last run again! If nothing else, training with Grant makes me realise how far I’ve come. After the 2 miles I could run on and on. When we arrived home I did my ab reps. Boy they are tough for a woman of very little musculature!! However I know they will get easier. I started with 10 reps, although thinking about it I did 10 reps on the right side and 10 reps on the left side on at least two sets! Maybe I need to rethink those? Or just carry on and see the progress even faster? I always find the Plank a tough exercise and in this case I do a plank press up of sorts. That is really tough! Tomorrow I have a 5 mile run planned for my half-marathon training. Bring it on! Since starting running and with very little dieting, I’ve managed to drop a dress size and one stone in weight. When I weighed myself at the start I was horrified to see that my weight had crept back up to my all time high of 12 stone (76 kg/168 USlb); I’m now sitting at 11 stone or just under anyway (69kg/152USlb). It took a long time to lose, but it’s staying off. The detox I did at the start of the year helped and I don’t think I look overweight anymore, but I would still like to lose another stone. I like my food, although I eat pretty healthily anyway. My treats consist of raw carrots and houmous, not chocolate and crisps! As a vegetarian veering towards veganism, I really don’t think I need to worry about dieting, I just want to ensure that my body is being correctly fueled. Especially as I put it under a greater strain by upping my running distance. Looking in the mirror this morning I knew that they only thing I really need to do to improve my body is to strengthen those abdominals. I have, what is known as, a mother’s apron. That describes the loose bit of flabby belly that overhangs my section scar, common on ladies that have had a baby by Caesarian Section and don’t have Posh’s money have an immmediate tummy tuck! It’s better than it was, but hard work is the only thing that’s going to make it go away now. All I need to do is blow up my stability ball, which my husband was convinced I’d never use and deflated (bless him), and I’m away. Starting today. On the hubby training front, we’re into week three, consisting of a warm up 5 minute walk, a 90 second run and a 2 minute walk repeated 6 times over 20 minutes and a cool down 5 minute walk. We’ve done that twice this week, once of tarmac, once on the trails and we have one more to do. I’m going to try and get him to do that on Saturday because on Sunday I have a 5 mile run to do as part of my half-marathon training. Sadly internet doesn’t seem to have reached North Yorkshire, or at least the bit I’ve spent the last week at, so my blogging has taken a bit of a dive. However, my running hasn’t and I have a new recruit in the form of my husband. Whether or not it was the sight of his wife doing the Race for Life or just being involved with the whole race thing, my hubbie has decided to try again to reach his running goal of 5k. He last tried in October of last year when we were on holiday. Training lasted a couple of weeks or so and then he stopped, finding all the excuses we do sometimes manage to find (too busy, too tired, too something). He was doing well, although I did think that he was trying to run too fast too soon and maybe that was the kicker. So last week I did three runs with hubbie for his week one of training. Each one was a 60 second run followed by a 90 second walk and I paced it at a steady 9kph. That gave us a 2 mile distance over the 30 minutes (including warm up and cool down walks of 5 minutes each). On the last run of the week I carried on to do another 2 miles for my 4 target on my Half training. It worked well and today, even though it’s our anniversary and we’re heading out for a meal, hubbie has already said that we’re running when he gets home! He’s on for a 90 sec run and a 2 min walk repeat tonight and that’ll have to do me too! Done and Dusted: The end of my virginity. 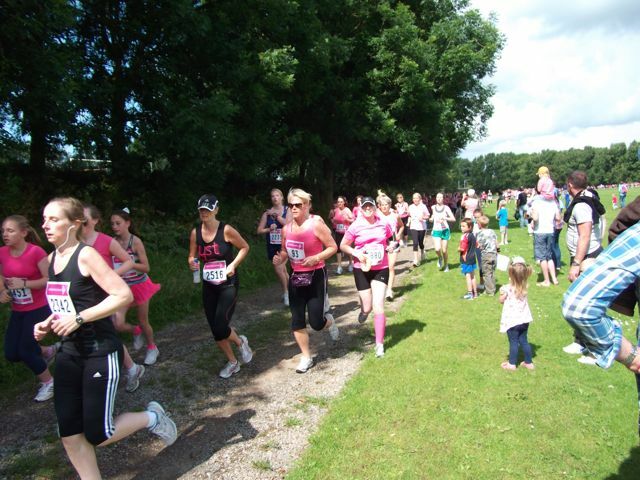 Well it ‘s the day after the day before and on the day before I ran my first race, the Race for Life 5k in Carlisle. I had my kit all laid out from the night before, but changed everything the next morning! 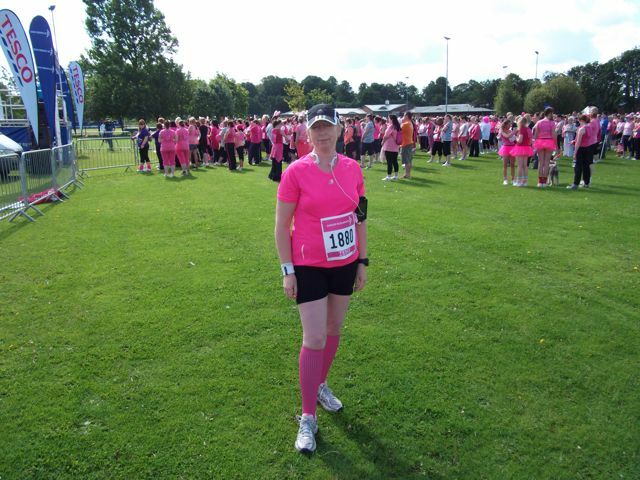 I decided that being comfortable was far more important than wearing the pink that the event called for (here women’s cancer research is symbolised by the use of pink in their advertising and so events call for women to dress up in pink and as flamboyantly as possible!) I did, however, stick with my pink compression socks. We arrived early and parked up nearby before it got too busy. In reality I didn’t have that long to wait before families started arriving and the local radio station started broadcasting the warm up. I wasn’t going to do the warm up, intending to stick instead to my routine walk, but I got caught up in the atmosphere of the event and found myself doing a workout to some dodgy 70’s disco music before I knew where I was! Both husband Grant and son Ben had volunteered to help with the running of the event. Ben asked to be involved at the end, handing out goody bags to the finishers, whilst Grant somehow became the back marker, walking the course to make sure that no one was left behind. In my eagerness to get started I forgot all about my husband and son and as soon as the runners flag went up I went and dutifully lined up behind it. They were left to see me disappearing off and not see me to wish me luck. I guess I didn’t feel I needed it, but I do regret not even just turning around to say see you later! I was in the zone by then, focused on my race. At 11am the starting hooter blasted out and I started off about six off the front and stuck to my music determined pace (thanks to BeatSync and Jeff Galloway). I was overtaking people from the start, but never got close to the front runners – not that I was really expecting that! After four minutes of running at pace Jeff told me to walk. The first call for the walk break was a toughie; we were still running the circumference of the field and people were cheering and clapping us on. Suddenly I stopped running and was very self conscious. What were they thinking? Could this woman not even run for a few minutes before she had to stop? However, before I knew it, I was off running again and passing those that had passed me as I walked. If anything that is a great bonus of the run-walk system, you aren’t really aware of being overtaken when you are walking but very aware of flying passed people when you start running again. It’s a great psychological boost. I yoyoed with fellow runners like this for the entire way round, starting to recognise backs as I overtook them and as they overtook me. The course consisted of mainly grass and the ground was soft after a very heavy thunderstorm the day before, which just zaps your leg energy. When I ran on the little bit of tarmac there was it was a huge relief. I knew early on that I would be lucky to run a 30 minute race. The weather was, by then, very warm and there was little shade. These aren’t excuses; this is how it was. Once I was back on the start field again and I could see the finish gate I just ignored Jeff’s instructions to walk and ran through the slower music at my race pace. The sight of the finish really does spur you on and, on this course, you could see it for the entire last kilometer! I crossed the line in 30:12 and was very happy with that. After collecting my medal and goody bag from my son (which was wonderful) and then having all sorts of strange things thrust into my hands by people I went to sit in the shade and cool down. I didn’t know anyone else running that day and my supporters were busy, so I had my own company for a while. 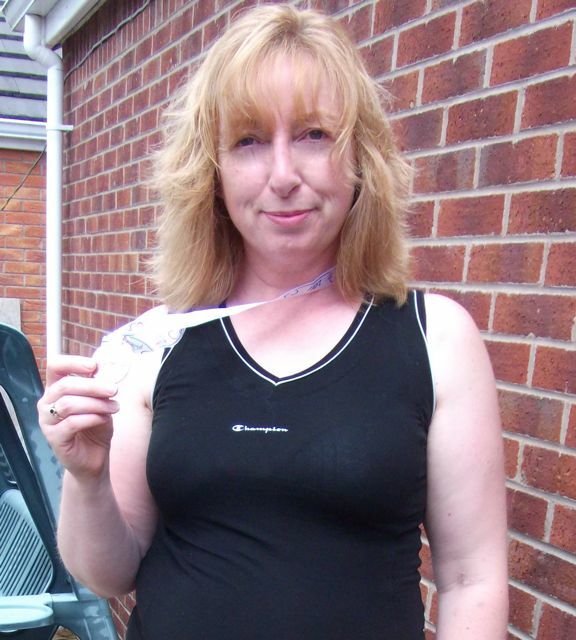 I updated Facebook and then had the company of another solo runner, Kimberley from Barnard Castle. She too was running her first race and we chatted for a while about running. It was nice to have someone similar to talk to as our red faces became slowly less red! She had logged the race on GPS and thought it was 5.55km. I’m not so sure. She was using a Nike+ chip in her shoe and I’ve heard that these aren’t so reliable. Maybe it needed calibrating? All I know is that when I switched Jeff off in the finishing straight he was telling me I had just a few metres left. So that’s it. I am no longer a race virgin! I have the bling and the photos to prove it and an overwhelming sense of personal achievement. And also a perverse desire to do that again! OK, well to say I’m nervous at this point is probably a bit of an understatement. 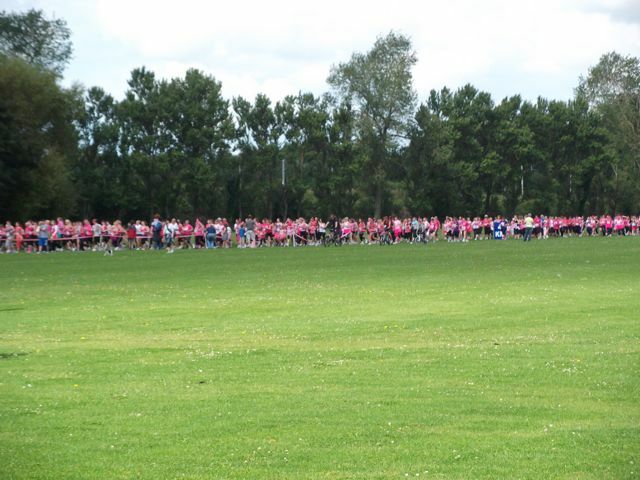 The last time I did a Race for Life I walked it with a friend who sadly died a few years ago. I must admit that, although her death was not cancer related in the slightest, I will be thinking of her when I’m running tomorrow. Smile down on me tomorrow Celia. I’m not worried about the race. I know I can run 5k easily. I’m not worried about the time. This is an unchipped race and I just want to do it, although I will time it myself. What I am worried about, as a race virgin, is all the logistical stuff, such as where to park, what time to leave, where to leave my stuff – that kind of thing. I need to get this race under my belt to settle any worries like this. My husband will be there of course and in the week my 19 year old son announced he wanted to be there too. 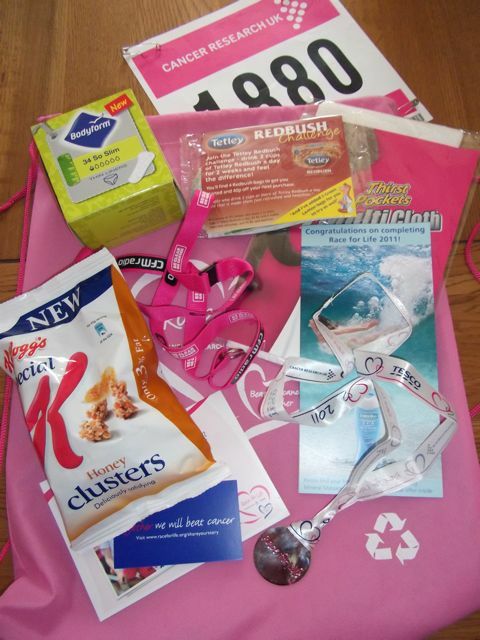 So, 11am BST I should be running in all my pink stuff! I will be incredibly difficult to spot though, because every other woman there will also be festooned in pink! I’m feeling a bit subdued, so adios and I’ll let you know how I got on tomorrow night.